An act of betrayal can have devastating effects on an individual. 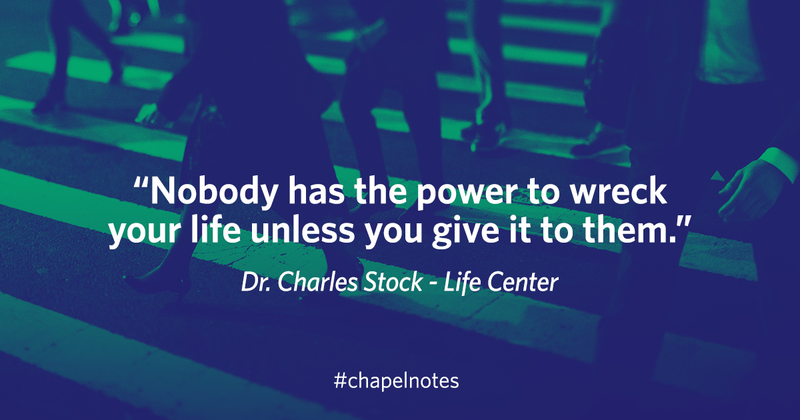 But for Dr. Charles Stock, senior pastor of Life Center in Harrisburg, Pennsylvania, it drove him into his destiny just as it did Joseph, one of the Israelite’s patriarchs. On Wednesday, March 21, Stock discussed his own experience with betrayal, discipleship and love at University Chapel. As young Christians saved in the 70s, Stock and his wife started a church in Northern California. Its congregation budded quickly, and in a year, had reached 1,000 members. But after experiencing what he described as a betrayal from other leaders in the church, Stock and his wife made the decision to step down as leaders of the church. “Nobody has the power to wreck your life unless you give it to them,” said Stock, noting that he and his wife chose to forgive those that’d hurt them. Shortly after, they received an opportunity to move to Pennsylvania and pastor a small church. Initially resistant to leaving California, both Stock and his wife confirmed through prayer that it was the right thing to do. Shortly after, children in tow, they made the move to the east. The first church they pastored closed, and Stock said he began questioning God’s purpose in telling him to move. Although the season was one of heartbreak and difficulty, it was the “setup for the greatest season of our lives,” Stock said. Stock was given another chance to pastor a church in downtown Harrisonburg, Pennsylvania. There, he and his wife, as well as their ministry, thrived. They eventually reconnected with the pastor who’d been a major catalyst in their stepping down from the ministerial position they’d held at their church in California. He not only received their forgiveness, but became a dear friend of the Stock’s. To Stock, this model of unconditional love is of paramount value to the Church. Loving others and recognizing their inherent, God-given value, Stock said, creates honor.